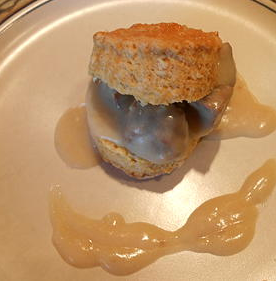 best vegan biscuits and gravy recipe Vegans Eat What? This recipe represents kind comfort food at its best! 2 T (heaping) baking powder. In a small bowl mix together the hemp milk and oil and stir it into the flour. Stir just until blended - Do not over mix. Drop by heaping Tablespoons on an ungreased cookie sheet or into muffin tins and bake at 425 degrees for 12 to 15 minutes. Put all gravy ingredients in a high speed blender and blend until very smooth. Pour into a small saucepan and bring to a boil stirring constantly until thickened. Add additional Bragg or soy sauce and freshly ground pepper to taste. We sometimes add cooked & crumbled vegan sausage or sauteed mushrooms to the prepared gravy. You can also add peas and/or chopped greens.